What do you do when you are half a world away from family,friends and traditions, and your cherished Christmas decorations are in storage? You're in a country that makes all the world's ornaments, yet doesn't have a clue what is happening? You make your own of course! Now let's hope we can find a decent live Christmas tree in the middle of Beijing. He's coming! He's coming! He's coming! My girls fixed me dinner for my birthday! Remember "Keep America Beautiful" and "Don't Mess with Texas?" Remember the poster contests we entered in school for the best slogans and ad art? My kids' generation has a new slogan: Reduce - Reuse - Recycle. (I might have added replenish or replant, but they didn't consult me.) And with the new slogan came a new art twist: Recycled Art Contests. Hannah and Bethany entered the contest this Spring and during the last week of school the students from each grade got their commendations. Once again, Bethany's art won first in the entire Kinder class and once again, Hannah came in second for the second grade. They got an awesome olympic-sized medal and lots of kudos from the principal. I got the joy of helping them travel from brainstorming ideas and materials to sketching out their ideas and making them reality. I do love the process and environment of making art coupled with envisioning potential beauty in discarded stuff. There is so much of God in that. Then there were the photos. Every photo site had gorgeous pics but my favorite by far is a website called Kayak Paddle Tales written by a kayaking guide in Florida. She is also a phenomenal bird photographer (see esp. her post dated 04.17.09) But these muses aren't helping. I'm still terrified of free-hand drawing. So with my head full of pictures and ideas I tried sketching in my art journal. eeew. Back to the drawing board? Ack! Art is not for the faint of heart. Back when vinyl came in discs a little larger than cd's; back when blackberries grew in ditches and I was allowed to ride my bike to pick them; I listened a lot to a forty-five my mother saved from the fiftie's - "Mockingbird Hill" sung by Patti Page. And clambering around in those ditches by the railroad tracks in down in Sumter, South Carolina, I learned early the call of Jays, Cardinals and Mockingbirds. Last night, walking in twilight, the girls and I heard the many trills and tunes of one Mockingbird, sitting so low in a young southern pine, he could have been on my shoulder. The girls didn't scare him, my flash didn't scare him, and he continued to sing with such vigor and happiness I can only imagine that maybe he was a new proud dad. We counted over ten songs in a two minute span. Forget stopping to smell the roses. Listen to the lullabies. And while you're hear, um here, take time to read this meditation on sound and silence down on the corner from the poet, Allison Smythe. I made a spur of the moment commitment yesterday that will come back to haunt me... I hope. 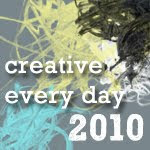 I linked to a blog that challenges artists to be creative every day, in some way. No pressure. Besides, I really really like the website's button that links you to the challenge page. And in November there is a really cool button for doing art every day of November. Just in time for Advent. Well, the theme for the month of May is "Nature." And since it is against my nature to cook or bake, I decided to bake a home-made apple pie for my family last night on the last day of April and post it as my first CED challenge for May 1, 2009. China is not a culture enamored of pets - at least not when compared to the American obsession with making the pet a part of the family. But the Chinese are good at turning just about anything into a pet (or alter ego.) I once asked a class of freshmen, "Who owned pets while growing up?" To my surprise, several students raised their hand. You see in mid-century China, owning a pet was quite bourgeois and unacceptable (as were flower gardens, but that's another story.) So my students kept crickets, mantises and silkworms. Nevertheless it was in my husband's hometown where I first witnessed a shrimp on a leash. Brad's niece begged her grandparents to let her keep dinner for a pet. To no avail. Last night Hannah excitedly ran from the creek and yelled for me to "Come see what Nai Nai caught!" I grabbed my camera and met up with Bethany who was keeping her distance from Nai Nai. My mother-in-law was grinning ear to ear and swinging what Hannah called "a lobster" on a string. It was certainly the size of a small lobster and would have made great jambalaya, but after a few minutes watching him scoot backwards and grab the string with one free claw, I convinced Nai Nai to remove the string and throw the poor guy back in the water. I think she chastised me in Chinese, but I'm not one to play with my food before eating it.